Large or small Debbie Sheaf & Associates can also help orchestrate a great gathering or special event. Debbie’s complete involvement in the design process and lifestyle of her clients has led to many opportunities to entertain for others. 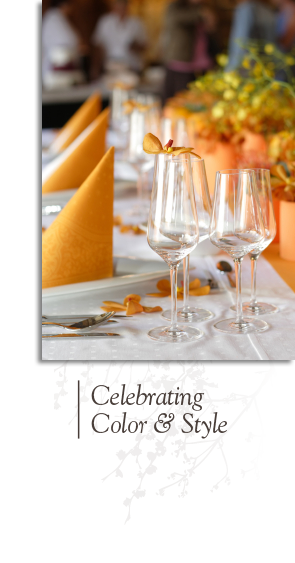 We provide full event planning services, as well as private consultations with an event planner. It is our philosophy that each event should be unique and intimate, no matter its size or location. We take pride in providing each client with the most innovative ideas and latest trends in the industry. In 2003 when Martha Stewart launched her Martha Stewart Signature Furniture line with Bernhardt, Debbie worked with the team from Martha Stewart’s organization to carefully orchestrate a local guest appearance. More than 300 plus guests were in attendance with a private luncheon for 75 people. High standards and branding were the number one priority of Martha’s visit. Use extensive training and experience to arrange every detail and bring the client’s vision to reality.